Are you looking to set up a business in Virginia? Do you feel that now’s the right time to start pursuing a life on entrepreneurship? If you have answered yes, look no further than The BBQ Cleaner. We would like to share with you that many families in Virginia love to BBQ. The issue they are facing is the cleaning up part. Some grills have been inadequately cleaned and dirt and grease were allowed to build up over time. To prevent potential health hazards from further developing, these affected grills must be professionally cleaned. That’s where you come in. We are looking for individuals who share our passion of bringing the best BBQ grill cleaning services to homes in Virginia. We are offering a BBQ cleaning business opportunity that allows potential business owners to add an additional stream of income. What’s more, it is up to you to decide how many days a week you would like to work, and how many hours at a time! This is a tried and tested system, and your business can turn profitable in no time. Why Start a BBQ Cleaning Business in Virginia? Love for Outdoor BBQ: In Virginia, the number of months of rainfall per year is minimal. Plenty of families will need BBQ grill cleaning services. BBQ grills can be commonly found in many Virginia You have a large pool of potential clients to make money from. A One-of-a-kind Business: Hardly anyone wants to clean their own greasy and dirty BBQ grills. Even if they do, they might not be doing a thorough job. You can be that place where grill owners can turn to for help. Ability to Scale Business with Ease: You have access to all the support and training your business needs to grow into a successful company. How Does The BBQ Cleaner Help You Get Started in Virginia? 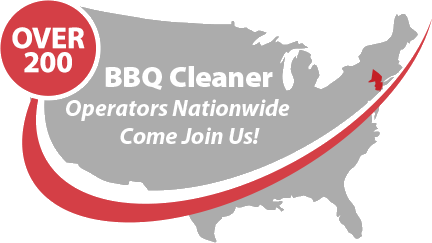 The BBQ Cleaner has built an extensive network of more than 180 operators nationwide to date. We are a global leader in the BBQ and grill cleaning industry and we have the ability to help you unlock limitless earning potential the moment you start your business. Since our inception in 2009, The BBQ Cleaner has been working arduously to help our clients grow their business successfully. We provide on-going lifetime business support to ensure your business does not get left behind. Talk to us today to find out more about this stellar BBQ cleaning business opportunity in Virginia!